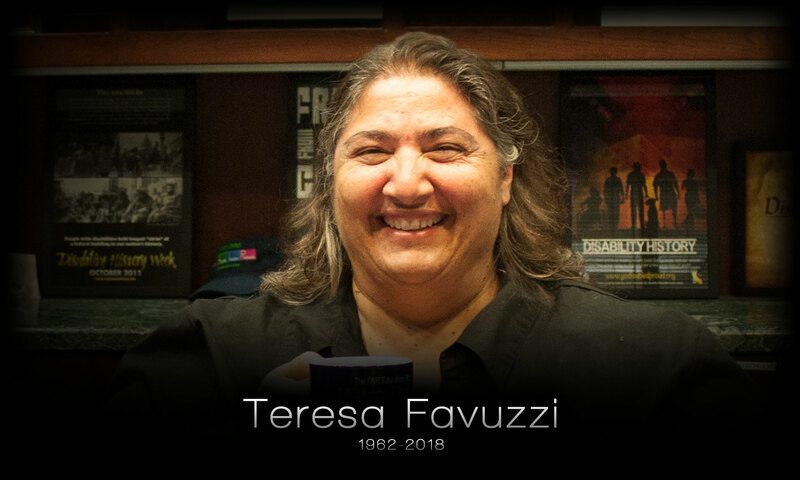 To friends and colleagues in the national Disability Rights movement, Teresa M. S. Favuzzi, aka "Fearless Favu", was an intrepid leader who made the fight for justice, equality and inclusion her life's focus. On Monday morning, February 5, Teresa passed away quietly at home with her beloved wife, Carol Bradley, by her side. She was 56. Raised in Pacifica, California by Italian-American parents, Dominick and Mary Rose, Teresa was proud of her roots and deeply loved her family. She could be counted on for belly-laughing stories, and was gratified to share that although she dropped out of high school, she went on to attend San Mateo College and later earned a Master's Degree in Community Organizing from the State University of San Francisco (SFSU). It was during a Social Work and Disability class at SFSU that Teresa first began to identity as a disabled person. It was her personal disability experience that led her to an internship and later a management position at the Independent Living Resource Center of San Francisco, one of twenty-eight centers in California dedicated to full social and economic inclusion of persons with disabilities. In 2003, Teresa began her tenure at the California Foundation for Independent Living Centers (CFILC) as the statewide Community Organizer. Her leadership and organizing skills brought together the California Systems Change Network that works towards creating systems to more efficiently serve and support people with disabilities in maintaining their independence. Teresa was known as a strategic thinker who could execute big ideas. In 2005, with the support of disability rights colleagues, Teresa launched Disability Capitol Action Day, California's largest advocacy event for disabled people of all ages. In 2013, she was honored for that accomplishment and in 2017, the coalition that plans the event established the Teresa Favuzzi Mobilization Fund in her honor. In her 15 years at CFILC, Teresa achieved numerous accomplishments. She became Executive Director in 2005 and led the organization through some of the toughest social and healthcare service cutbacks experienced by the disability community in California. She was passionate about access to quality healthcare as well as emergency preparedness. She advocated tirelessly to assure the needs of the community were always centered in policy decisions. Teresa devoted her time, resources and considerable talent to improving the quality of life for all people with disabilities. Teresa was diagnosed with Leukemia in spring 2017. Like everything else in her life, she took the illness on as a challenge and fought every single day. Teresa continued to share personal journey, her friendship, her kindhearted spirit, her heart and thoughtful words of wisdom with everyone around her. Teresa is survived by her wife, Carol Bradley, mother, Mary Rose Favuzzi, her brothers Dominick Favuzzi, John Favuzzi, her sisters-in-law, Marjorie Favuzzi and Barbara Favuzzi, nieces, Marina Favuzzi, Christina Favuzzi, nephews, Josh Istre, Michael Favuzzi, Marcus Favuzzi, additional extended family members and an enormous number of friends and colleagues who loved and cared for her infinitely. Services have not yet been scheduled. CFILC will host a Celebration of Life in Sacramento, CA in June. Additional details to follow. In lieu of flowers, contributions can be made online to the Teresa Favuzzi Mobilization Fund, or via mail, checks made to the address of CFILC in memory of Teresa Favuzzi, 1000 G Street, Suite 100 Sacramento, CA 95814.